A Northern White rhinoceros, Sudan had been in captivity since he was 2 years old — in 1975. In 2009, he was transferred to the Ol Pejeta Conservancy in Kenya with several other white rhinos as part of its “Last Chance to Survive” breeding program — an attempt to save them. White rhinos are so heavily poached — for their horns, which are thought to cure diseases — that Ol Pejeta kept the animals under 24-hour protection with armed guards. 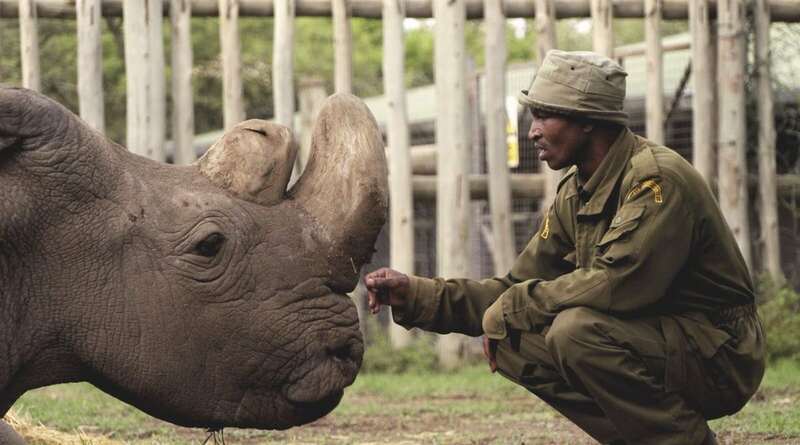 By the time he died, Sudan could no longer stand. Photo by the Ol Pejeta Conservancy. But with Sudan’s death, “the only hope for the preservation of this subspecies now lies in developing in vitro fertilisation (IVF) techniques using eggs from the two remaining females,” a Conservancy spokesman said. “Throughout his existence, he significantly contributed to survival of his species as he sired two females.” Before he died, the Conservancy also collected genetic material from Sudan in hopes that future breakthroughs will enable them to bring the species back. But as of now, the only surviving Northern White rhinos are female, and there are only two of them. “We can only hope that the world learns from the sad loss of Sudan and takes every measure to end all trade in rhino horn,” says Peter Knights, the head of San Francisco-based WildAid, which works to reduce the demand for “products” taken from wildlife. “While prices of rhino horn are falling in China and Vietnam, poaching for horn still threatens all rhino species.” The Western Black rhino went extinct in 2011. With Sudan being the last male of his subspecies alive, the Northern White is likely to suffer a similar fate. Sudan died March 19 from age-related ailments. He was 45.